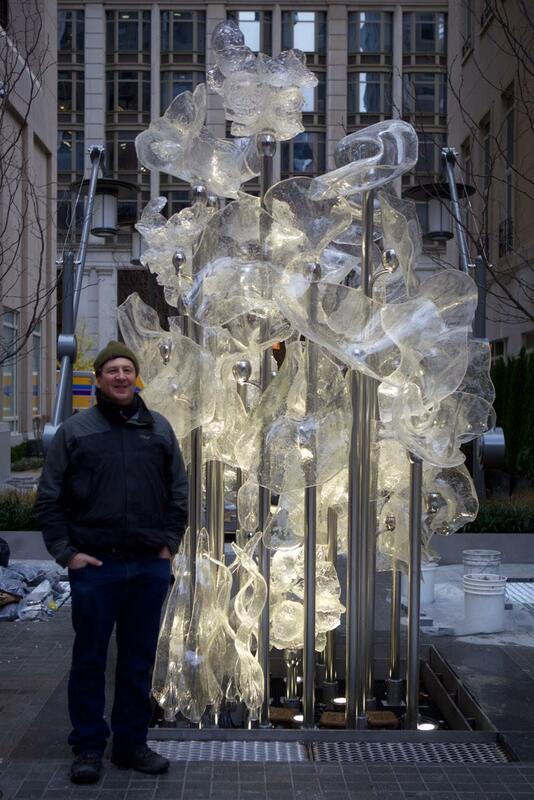 Martin Blank pictured with one of the two glass artworks that animate a city park in lower Manhattan. Martin Blank has called the concept of "flow" the unifying theme of the last 25 years of his career as an artist, and this is readily apparent in his latest public art commission. 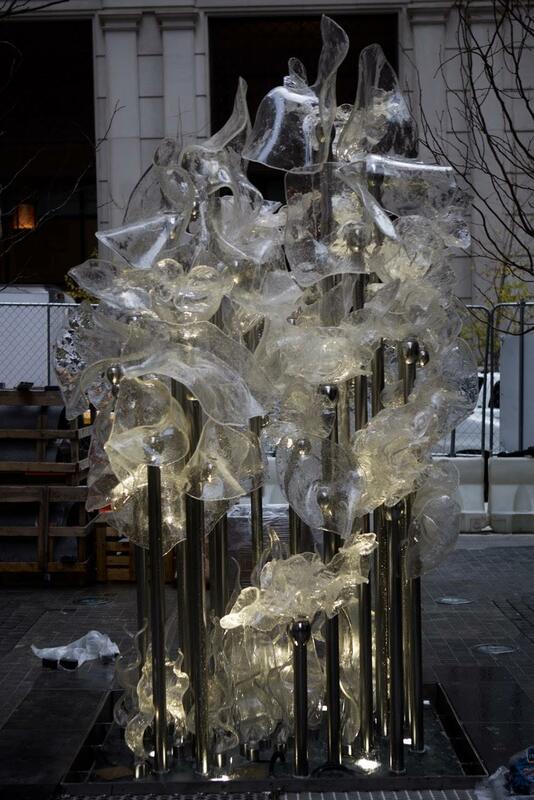 Set to be unveiled in Spring 2017 in the small city park next to the recently opened Four Seasons Hotel New York Downtown, Blank has created two working fountains in which the multiple glass elements mediate the falling water, and reference it in its cascading forms that appear like splashing water, or eddies. Contrasting with the restrained "New Classical" style of the building's architect, Robert A. M. Stern, Blank's exuberant work animates and enlivens the exterior space with its celebration of gravity and the shared fluidity of water and glass. 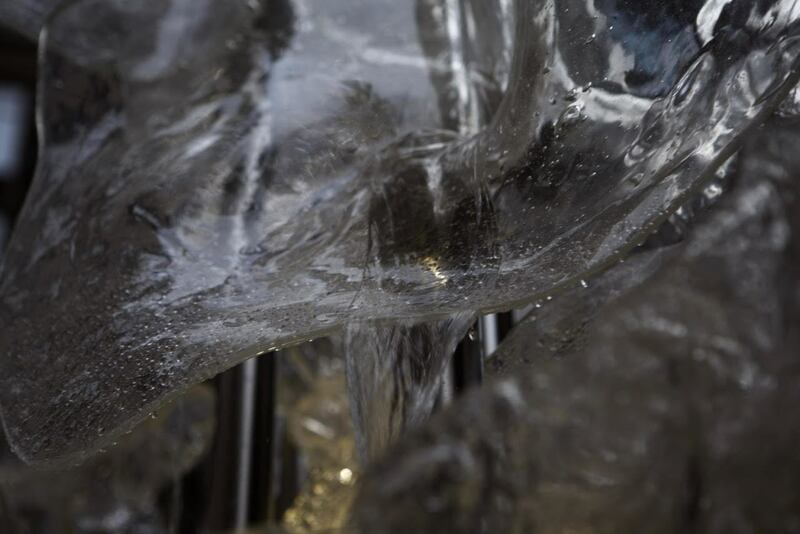 The GLASS Quarterly Hot Sheet spoke to Blank after installation was complete, but before the water would be turned back on, about the project that he calls "the hardest installation he's done in his career." 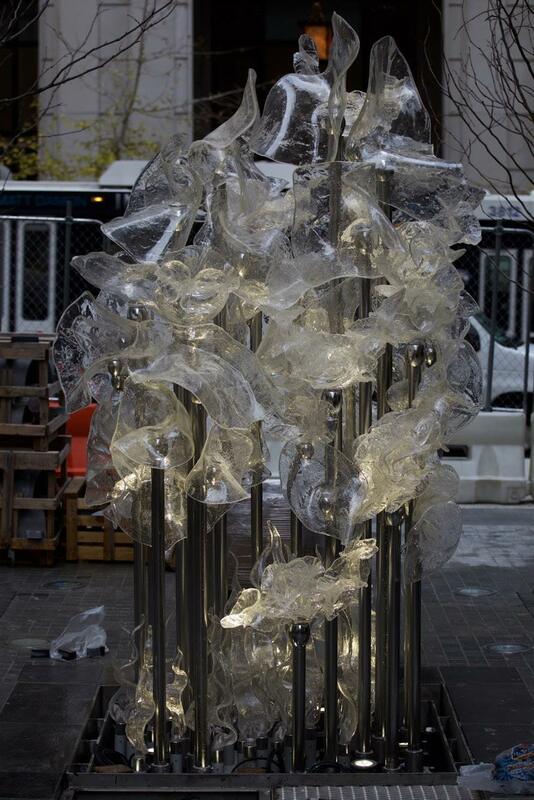 GLASS Quarterly Hot Sheet: This is a prominent public art commission. How did it come about? Was it related to the building project, and its the developer, Larry Silverstein, who is also a glass collector? Martin Blank: I've known Larry and Klara for many years; they’ve been supporters of my career from the beginning. I had the opportunity to share with them the book on Fluent Steps (2008), my outdoor project at the Museum of Glass in Tacoma, Washington. He was genuinely moved and excited, and I could tell something could happen in the future. Three years later, I was contacted and asked to give a proposal for a small park they were creating at 99 Church Street. GLASS: I imagine there were a lot of regulations to comply with. ​​Blank: I had to meet with city officials to deal with the regulations and codes. Ultimately, they told me you have a 6-foot square, and you can't exceed 11-feet in height. I was somewhat constrained, and would have loved to have had more space, but I think we maximized what we could out of it. 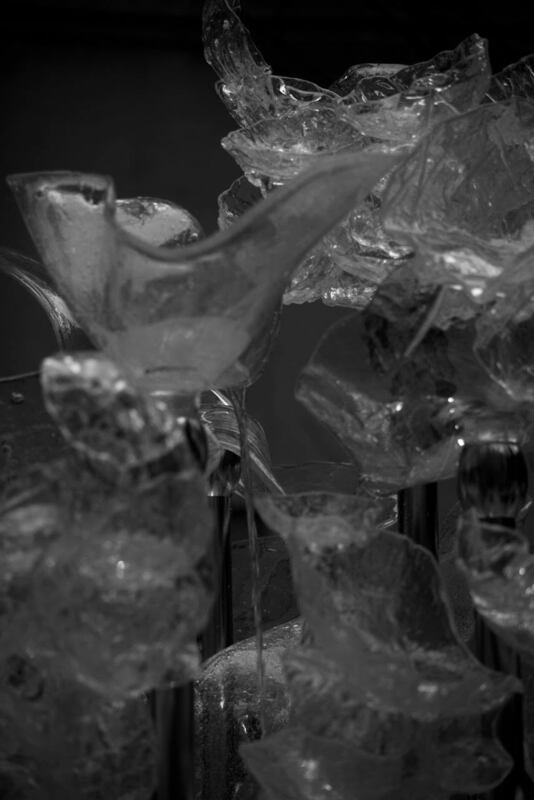 This project excited me because of certain aspects that enabled me to continue to expand upon the artistic language i developed during the Museum of Glass installation; to further explore the nature of water, current, steam, ripples, and eddies. It's a language and vocabulary I've been working on for the past few years. 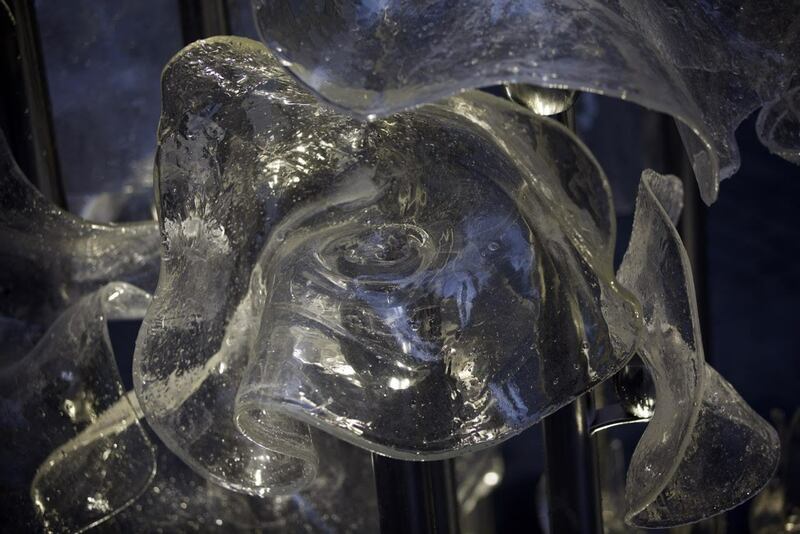 GLASS: What are some of the key differences between this project and Fluent Steps at the Museum of Glass? 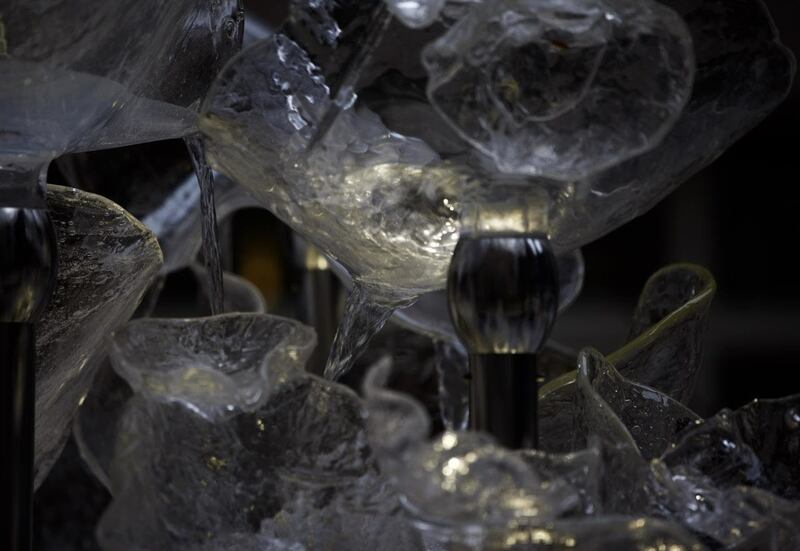 ​​Blank: The biggest difference is that this is an actual functioning fountain. Michiko Ashida, Vice President for Silverstein Properties, connected me with the experts at Delta Fountain, who worked on the massive waterfall at the 9/11 memorial among many other incredible fountains.They became my advisors on what kind of tubing, water volume, how many gallons per minute. They also helped me to develop my understanding and use of the weir, which is the edge where water flows over and which determines whether the water spurts or spits, how it moves. I had to learn so many new things. GLASS: It sounds like there were a lot of technical challenges in this project, and how did they affect how you addressed the creative side of developing the work? ​​Blank: There were many physical challenges to overcome just in manifesting this project; load capacity and deflection for the metal and glass, working directly with structural engineers to create a supportive base that would last a lifetime, and extensive research and time devoted to finding the proper shatter proof coating for the glass. Once everything was established in concrete reality I still had to create an emotive and transcending sculpture that satiated my artistic needs. I think being around water is a transcending moment, which puts you between two worlds. There's the main world we all exist in, and then there's the other world, which is the environment that water creates that draws us to it. We go to water to relax, to be moved, and in fact, we are ourselves 65 to 70-percent water, the earth is something like 70-percent water. Water has a very strong effect on us. You're in a mood or state, and you're changed to a different state. It opens you up, makes you feel like you're a part of the world around you. GLASS: This site is not far from the World Trade Center, and I have to ask you whether having the two glass fountains was in any way, consciously or not, a reference to the Twin Towers that fell in 2001? ​Blank: Not really, there was always the plan to have two fountains, but the goal was not to make a pair of identical candlesticks. Though they have the same language and sensibility, each one stands on its own. You want to draw the viewer around it, and through it. 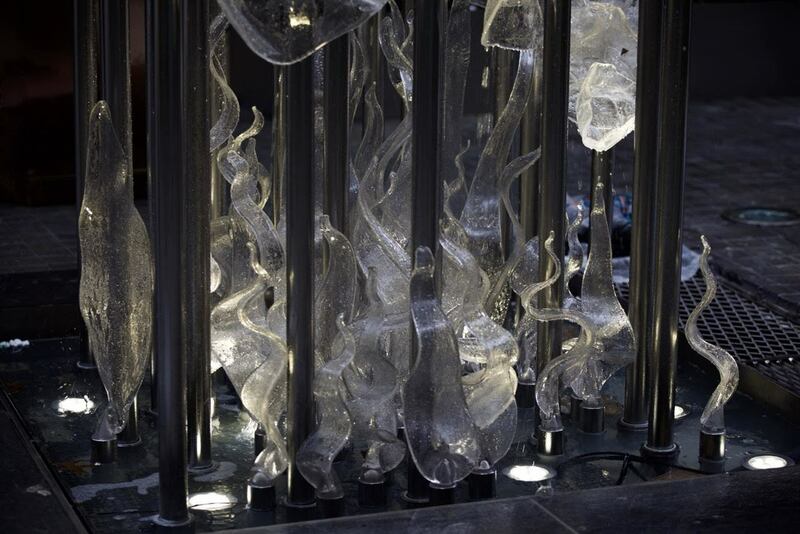 The north sculpture starts in the center and begins to helix and is made out of denser components. It has a 6-foot perimeter and peaks at 11 feet. The south sculpture is open and airy, almost seems to be evaporating, referencing the phases of matter. 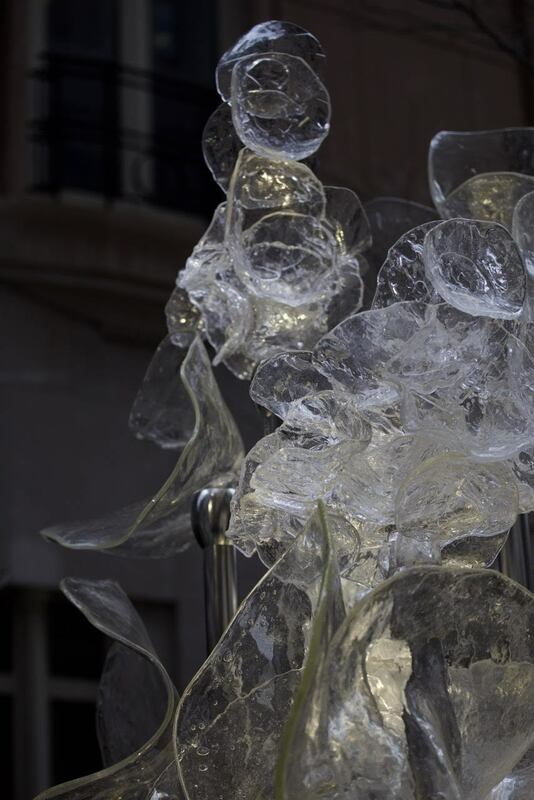 GLASS: Now that the work is installed, how do you feel about the results? ​Blank: It was the hardest and most rewarding project I have ever done. It does have a lovely human scale, and yet it's big enough you go "wow" when you stand next to it. You're looking up at it but not overwhelmed by it. In a way, they are like giant chandeliers. There are lights in the sculptures. And they turned out to be a perfect proportion to invite you to in, to look inside, while also powerful enough in scale so that you're moved by it. GLASS: What was it like having so much control over the water, to make the fountain an aspect of expression? ​Blank: When you get up close and look at the nuances, you can see how I played with the streams of water to create a lot of negative space woven together. The water play is an extremely important aspect of the work.